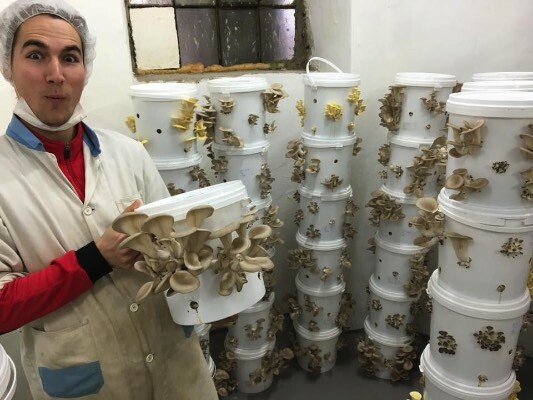 Here’s four stories from across the planet of growing mushrooms in the city, using waste products and offcuts to make nutrient dense food. Great examples of growing where you live, using what’s around you to nourish your community. 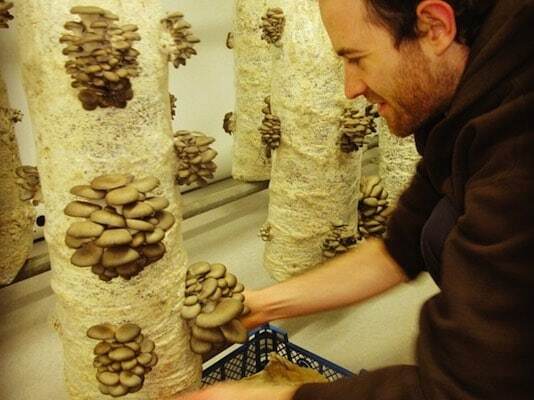 These four urban mushroom farms are in very different situations – Exeter UK, Vienna AT, Milwaukee USA, and Perth AU. They’re also working within different parameters, and on very different budgets. 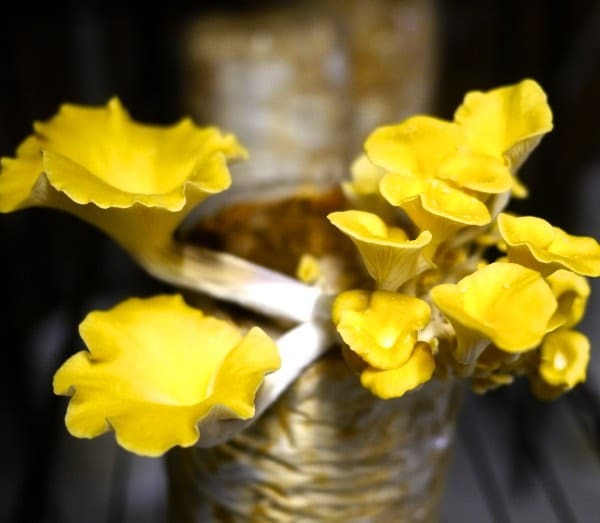 But together they show how adaptable mushrooms are to grow in small urban spaces, and how, with a bit of ingenuity and gumption, mushrooms can be an low-footprint (and delicious!) urban food source. Down in a small whitewashed basement, Manuel & Florian of Hut + Steil are filling bags and buckets with inoculated coffee grounds. 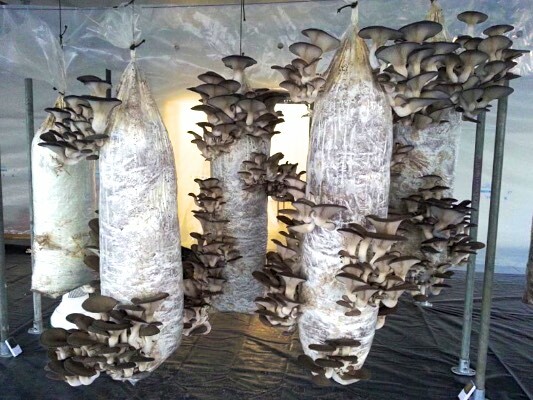 Stone, concrete or brick basements are perfect for mushroom growing because it’s relatively easy to stabilise both the temperature and the humidity, as long as you can maintain good airflow. They’re also a very common space in cities. 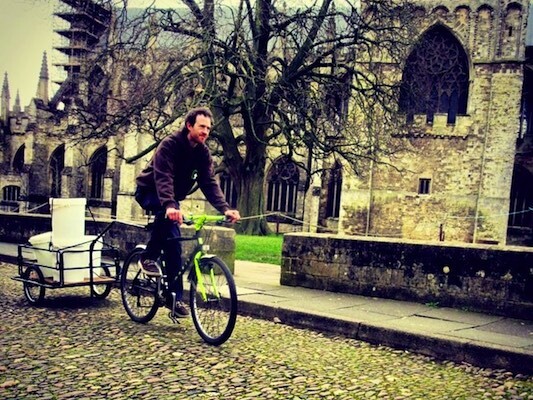 The coffee grounds are collected regularly from various cafes, via cargo bike. As the coffee grounds at this point are relatively sterile and already wet, it’s a short-cut to prep them as substrate for the mushroom spawn. 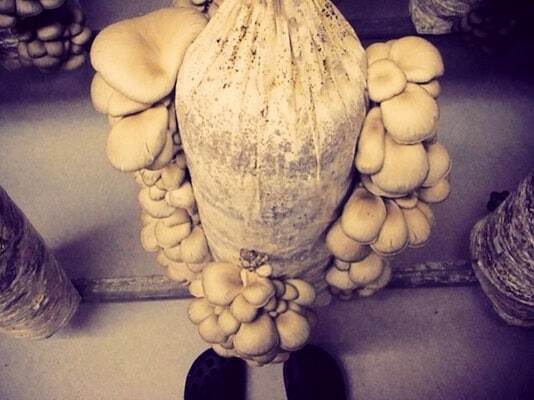 Aiming for a zero waste business, the Hut + Steil boys are looking at transitioning from using grow bags (single use, made of conventional plastic) to the milk buckets that they collect their coffee grounds in – a stable, reusable, and inert growing container for their oyster mushrooms. 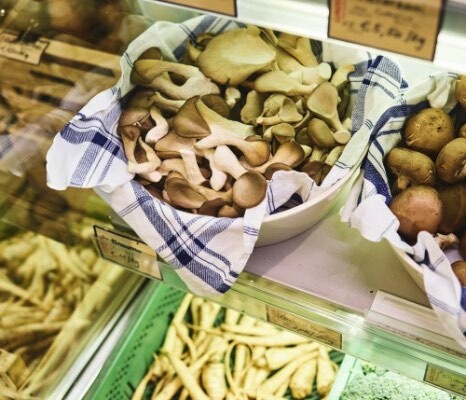 The more beautiful mushrooms are sold loose, to grocers and to Lunzer, Vienna’s first zero-waste supermarket – where they’re snapped up quickly. 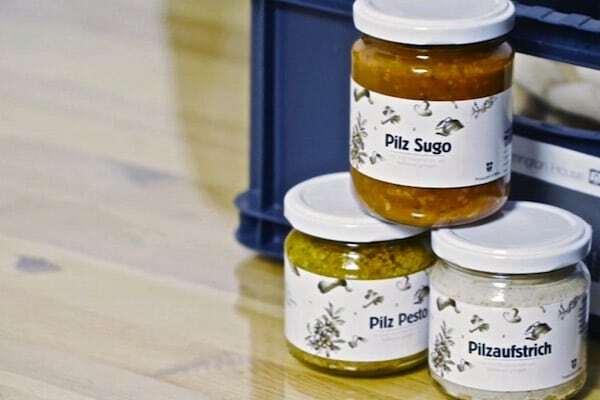 The less beautiful mushrooms are incorporated into pastes, pestos and sauces, in collaboration with another Viennese deli. 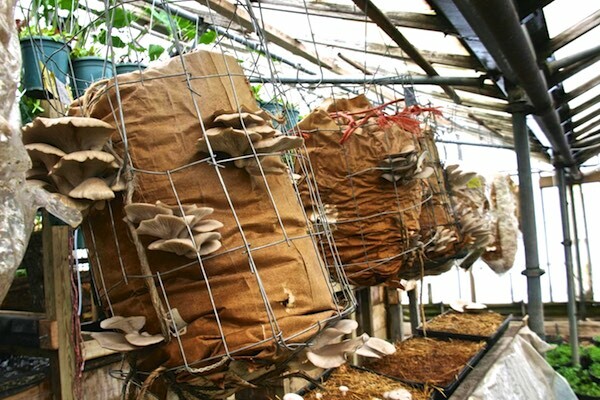 Once the substrate and mycelium is exhausted, it’s into a compost facility for the spend grounds, and back to the earth. Here’s a video about their enterprise, and their facebook page. 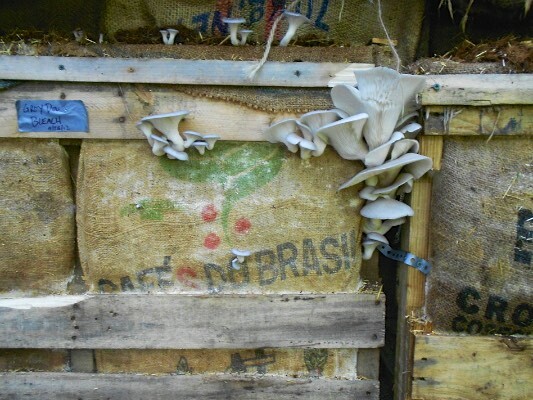 The Gro Cycle crew have re-purposed an old office building into their urban mushroom farm, growing oyster mushrooms on spent coffee grinds that are collected locally (again by cargo bike) in single use bags. 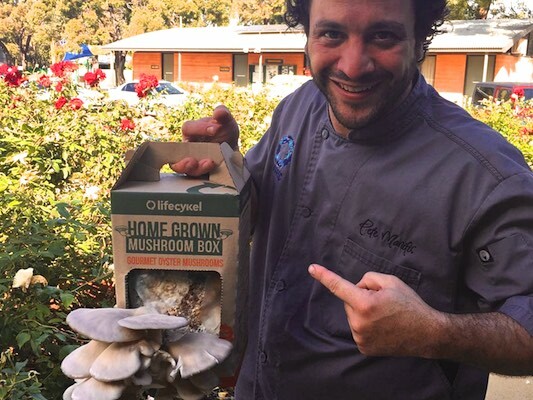 The Gro Cycle business model also incorporates cute home mushroom kits, which are great for community awareness, better understanding of fungi, and living business cards, too. 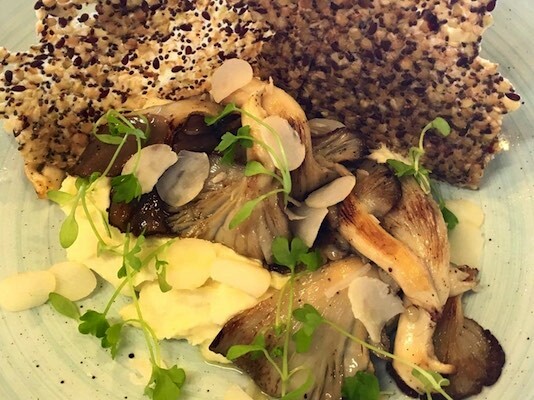 They sell their mushrooms to “the best restaurants and food outlets in the South West of England” and the spent bags are composted for local use. This urban mushroom growing model is a bit different to the ‘coffee-ground oyster mushrooms in deep urban’ model in a few ways. 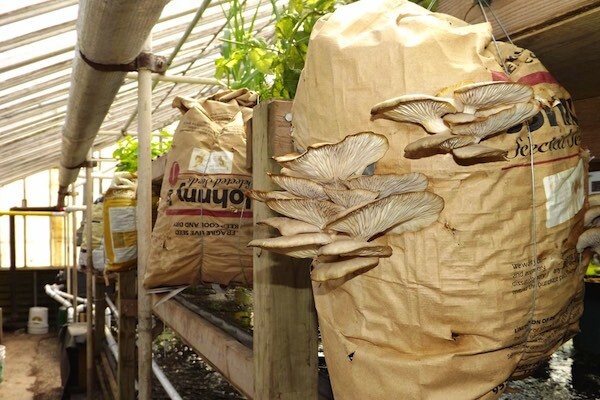 Growing Power use mushroom cultivation as a niche product in their vibrant (and vey inspiring) grass roots urban farm. 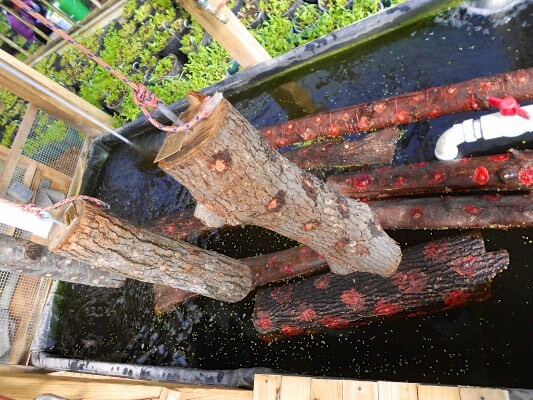 as space filling niches – the mushroom bags are both hung from the tops of the hoop houses, utilizing empty space, and the shiitake logs are hung at various levels above their aquaponics systems, with the shiitake logs being dunked in the aquaponics ponds periodically for force a flush of mushrooms from the logs. 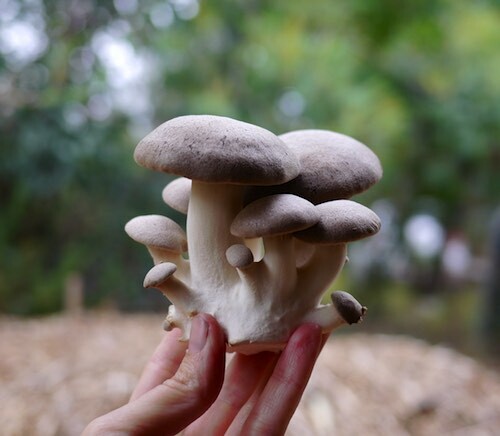 occasional product niche – when the various batches of mushrooms are ready, they’re added to the veggie boxes and market stall, and when they’re not ready, they’re not. 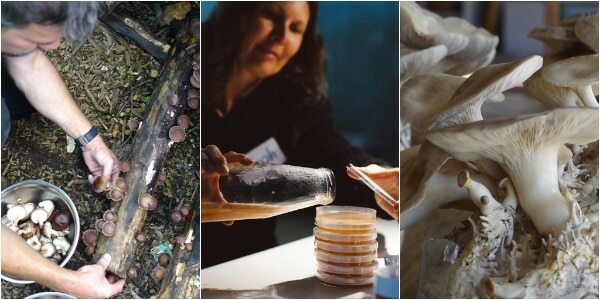 The mushrooms at Growing Power are also grown on, and in, anything that makes sense, and is readily available. 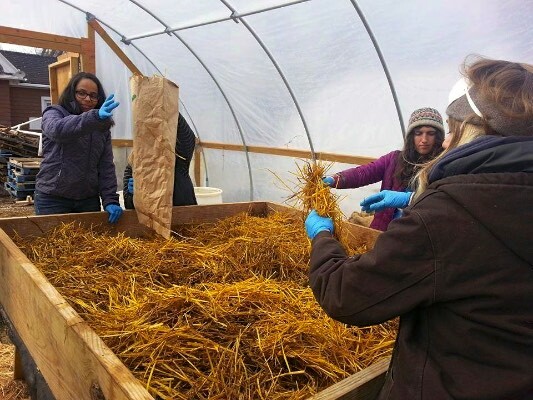 For the oyster mushroom substrate, they’re using pasteurized straw, instead of coffee bean waste. For the bags, they’re using whatever waste material they’ve got – strong paper bags, plasticised feed bags, burlap sacks and pallets. And at the end of the mushroom’s life cycle, they’re composting the lot (except for the plastic bags) to turn into rich humus to go straight back onto their many vegetable beds. 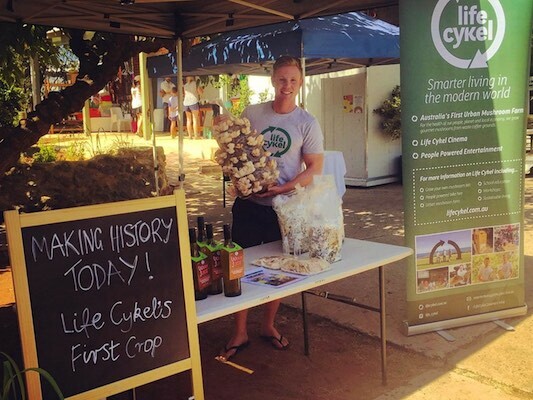 The Life Cykle crew Ryan and Julian are a recent startup in Fremantle, using spent coffee grounds (see a pattern here yet?) 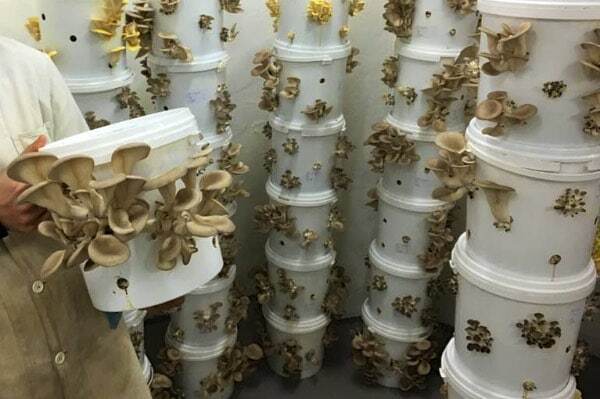 to grow oyster mushrooms in a series of shipping containers for restaurants and grocers, as well as producing home mushroom kits. They’re readily available and free as a common waste product in every suburb that has cafes. 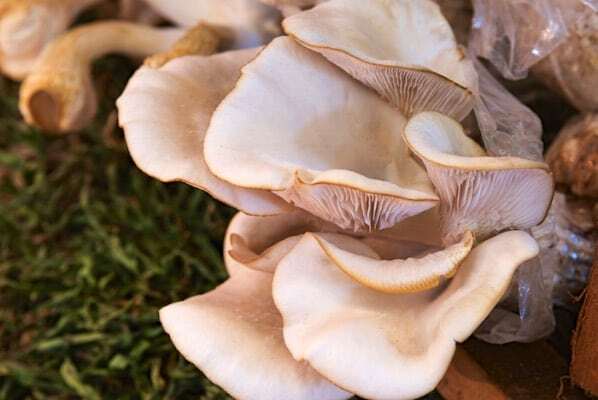 They’re an excellent food source for the mycelium, especially oyster mushroom mycelium. 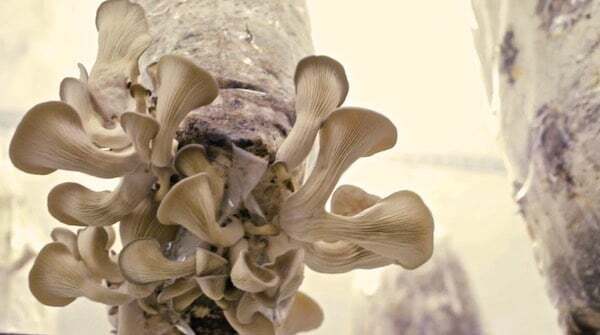 With 17% protein and significant quantities of Potassium, Calcium, Magnesium, Sulfur, Phosphorus & Iron, coffee grounds enrich your fungi’s diet. Coffee grounds can be a bit rich for some species, so they might need to be used as an amendment to a less nutritious material. Sometimes you can have too much of a good thing. ref. 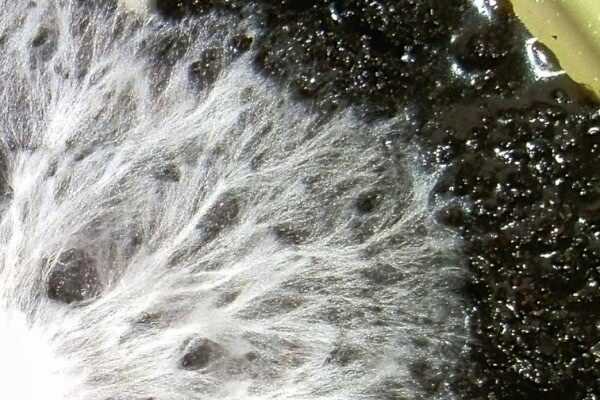 Small particle size – this means more surface area for the mycelium to make contact to and eat up the coffee grounds quickly, which leads to shorter turnarounds of fruiting mushrooms. 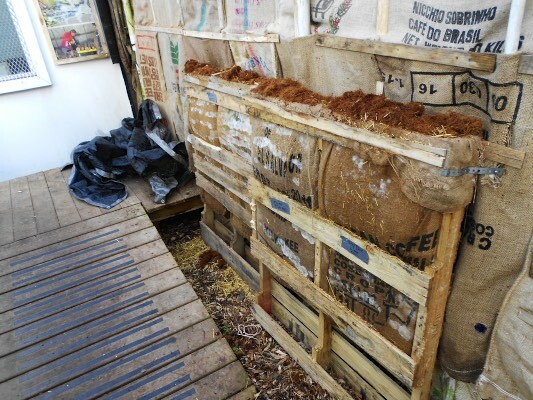 Again they might be too dense for some species, in which case you can make your substrate more palatable by adding some chopped straw or woodchip. Coffee grounds come pre-sterilised by the heat of the machine during the extraction process. If you can get the coffee grounds from the machine to a clean container and inoculated with the mycelium quickly enough they may not need any additional sterilisation. This skips a time consuming and energy hungry part of the substrate preparation process. They help reduce organic waste. Which is getting to be a big deal in cities, as it should be. 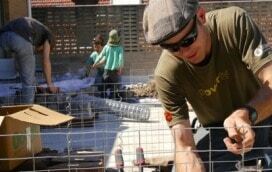 An aim in permaculture design is to think of ‘every output as an input’. Feed that energy back, feed it through, feed it round again. 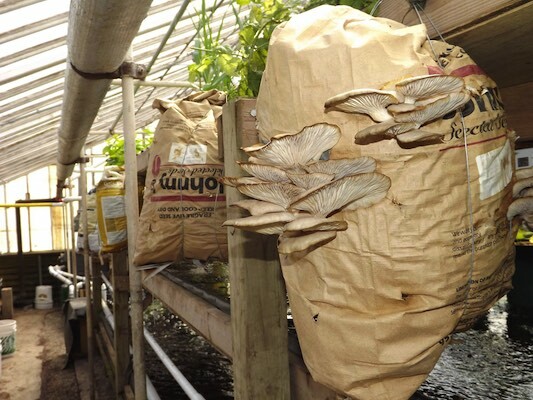 One of the things we love best about mushroom cultivation is that it’s so highly adaptable – from growing them in your bathroom or down the side of your house, all the way up to major enterprise levels, or on-farm integration. Wherever you live, though, there’s a way to get growing. Image credits: Growing Power: 1, 10-12, 15 | Hut + Steil: 2-5 | Gro Cycle: 6-10 | Joshua Capodarco: 13-14 | Life Cykel: 11-14. Wow what a year… Thank You! As 2015 winds up, we're winding down a little. Such a big year it . . So, independently replicated proof of concept for: a) small scale oyster mushroom farming on coffee grounds; and b) a market for them in places like… well, the same ones that produce the grounds. Looking forward to seeing a living mycosculpture (in glassed off enclosure) in a cafe soon! Ha – not quite yet Nick. In a tale that may echo the origin of agriculture itself, the poor wild resource this year (pineys near Sydney) is drawing me to only just start growing instead. But, I just drove past the restaurant and cafe at Centennial Park (had a quick squiz at the pines there that have the occasional edible) – that would be the place!